Top tables might be filled, but they’re not exactly top draws for visitors even in high season. The real story is at Madame Tussaud’s and other spots along the tourist trail. Apparently it’s not just stadium seats that are empty at London 2012. Shop owners and restaurateurs have complained that their businesses are suffering as tourists and locals abandon the West End. Bernard Donoghue, director of the Association of Leading Visitor Attractions, says visitor numbers at its flagship London venues had fallen by 30-35% last week. But hold on. If London is empty, isn’t this the perfect time to get into the best restaurants and shows? Martine Ainsworth-Wells from Visit London says we should take advantage and “enjoy London’s world-class restaurants”. Perhaps she’s right. 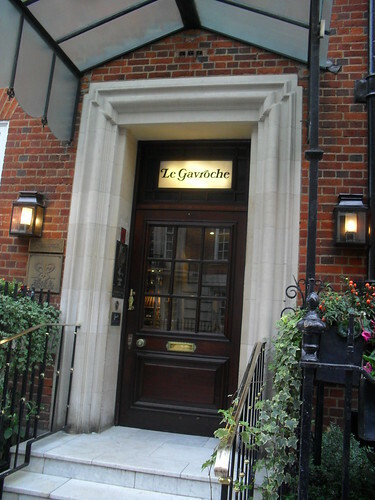 Le Gavroche restaurant in London. Photo by Javier Vte Rejas. Since its opening in January, Dabbous has become the most booked-out restaurant in London. Clearly now is the time to sneak in and enjoy the £54-a-head, seven-course tasting menu. Sadly, the Olympics doesn’t seem to have put gourmets off a trek to Fitzrovia. The receptionist says that there is no table until May 2013. A call to the three-starred Michelin restaurant Gordon Ramsay in Chelsea is equally unsuccessful – no table until January. Luckily the two Michelin-starred eateries Le Gavroche in Mayfair and The Ledbury in Notting Hill aren’t quite as busy. They can squeeze me in in October. At Noma at Claridges, the pop-up restaurant that chef René Redzepi is running during the Olympics, seats sold out months ago, and there won’t be any cancellations as the £195-a-head tickets are non-refundable I’m told, rather firmly. But just as I am about to give up, Pollen Street Social, Jason Atherton’s venture that opened to great fanfare last year, says it can give me something at 7.30pm, while The Wolseley has space at 9pm. Result. Standing-room-only seems to be the most likely option if I want to see Mark Rylance in Richard III at the Globe too. But Chariots of Fire, the ultimate sporting choice, has tickets left for the rest of the week. I fear that might be more to do with the reviews than the lack of tourists though. And then at last, unlike much of Team GB, I strike gold. Madame Tussauds, notorious for its year-round, hours-long queues, tells me that because the Olympics have “significantly impacted normal visitation patterns”, it is putting together a two-for-one offer until 12 August. With Jessica Ennis as one of the star attractions, it’s one way to see an Olympian.